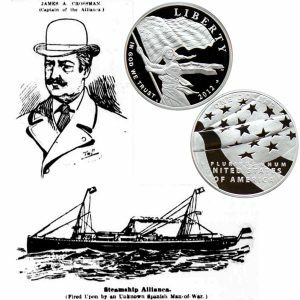 Today, the Star-Spangled Banner Commemorative Silver Dollar Coin remembers when a Spanish gunboat fired upon an American mail steamship after a salute of colors on March 8, 1895. Steamship Allianca Pursued for 25 Miles by a Spanish Man-of-War. Solid Shot Sent After Her. The American Carried Mails and Was on the High Seas—Secretary of State Notified. The American mail steamship Allianca, reached this port from Colon this afternoon. Capt. Crossman, her commander, reports that while proceeding from Colon to New York, on the morning of the 8th inst., sighted a barkentine-rigged steamship under the land off Cape Maysi, the eastern edge of Cuba, which headed directly towards her. At 7 o’clock, when two and one-half miles distant, she hoisted the Spanish flag, which was saluted by hoisting the American ensign and dipping it, which act of courtesy was answered by the Spaniard. At 7:15 she fired a blank cartridge to leeward, which was soon followed by another. The American ensign was again hoisted and dipped, but the course and speed of the ship were not changed. No hostile demonstration was anticipated, as the Allianca was more than six miles off the land at the time. The Spanish man-of-war was not satisfied, however, with even the double salute to her flag, but proceeded to chase the American at her full speed, judging from the smoke that came from her funnel. Seeing that the Allianca was drawing away, the Spaniard brought her guns to bear and fired a solid shot, which struck the water less than an eighth of a mile away from the ship and directly in line. This was followed by two more solid shots, which, fortunately did not reach their mark, though they struck the water in plain sight of the ship. At each shot, however, the Spaniard yawed to get the range of the American ship before firing on her, plainly showing the intention to hit her if she could. The Allianca Got Out of Range. Capt. Crossman of the Allianca, knowing he was more than two leagues from land and on the high seas, did not consider it his duty to detain his ship to find out the reason for such an outrage, even for so summary a demand, and so ordered full steam and gradually drew out of range. The chase was kept up for more than twenty-five miles, however, before it was abandoned. If the Spaniard had had more speed or her gunners been better marksman the incident would not have ended so fortunately for the American. The owners of the line are very indignant at the insult, and say they will demand a reason for the attempt made to stop an American mail steamship on the high seas in times of peace. Capt. Crossman’s Story of the Insult. Capt. Crossman has written a letter to the Secretary of State, at Washington, giving a full statement of the Spanish warship’s conduct. Capt, Crossman, of the Allianca, was seen on board his ship at pier 43 by an “Evening World” reporter. He confirmed the report that the vessel had been fired on by a Spanish man-of-war. “We were on the east coast of Cuba,” he said, “on March 8. We were in sight of Cape Maysi. It was about 7 o’clock when we sighted the Spanish war ship around the point. “We immediately saluted the vessel by running up the American colors. She returned the salute by flying her own colors at the masthead. “In the mean time we had slowed up our speed a little. We again flew our colors, which was again answered by the warship, and I signaled the engineer to go ahead with all speed. Supposed It Was Merely a Courtesy. “I had supposed that the vessel was merely saluting us out of courtesy. “You can imagine my surprise then when she fired three blank cartridges from one of her bow guns. “Again I saluted her by hoisting our colors and continued on our course. “Four minutes later a solid shot was fired which flew way astern of us, followed by two others in quick succession. “The nearest shot struck astern of us about a quarter of a mile away. “I gave the order to the engineer to proceed with all speed possible, and watched the Spanish ship through a glass. “I imagined that when the commander of the Spanish ship saw that none of the shots fired had taken effect on the Allianca he determined to give us a chase. “The Spanish warship was soon put under headway and started in hot pursuit of us. Gave Up the Chase in Disgust. “I ordered the engineer to get all speed possible out of his engines, determined that we would not recognize her order to heave to. “For twenty-five miles she chased us, slowly dropping astern. “What do you think was the real intent of the Spaniard,” the Captain was asked. “The American mail steamship Allianca, under my command, while on her homeward bound voyage from Colon, R. C., to New York, was, on the morning of March 8, off the east end of Cuba. “At 6 30 o’clock a barkentine-rigged steamer was sighted under the land bearing directly for us. At 7.15 she set her colors, proving to be a Spanish gunboat. “I immediately ordered the American ensign hoisted on the Allianca and saluted the Spaniard, which salute was duly returned by her, I then saluted once more, and supposed the matter was at an end. “But about five minutes later the Spaniard fired a blank cartridge, and a few moments later another one, followed shortly afterwards by three solid shots, all of which fell short of the Allianca, but showing very conclusively that the Spaniard was firing at us. I, being fully six miles off shore, and on the high seas, paid no further attention to the Spaniard but kept to my course. The Spaniard kept up the chase, although gradually dropping astern, fully twenty-five miles. “I desire to know if the Spaniard had any right to fire on my ship, with the possible chance of endangering the lives of the passengers and crew under my charge, or to compel me to heave to, as he probably intended. “I respectfully ask for information on that subject, as I did not and do not propose to heave to, thereby losing time on my voyages, to oblige the Spanish gunboats or any others except in case of distress. Purser Churchill, when seen by an “Evening World” reporter, stated that at 7 A. M. a Spanish man-of-war, whose name could not be made out at the distance of two and a half miles, heaved into view from under the shadow of the land. Almost from the very first the Spaniard seemed to be making directly for the Allianca. “The Spaniard could not have fired upon us on account of the peculiar arrangement of her guns, and when she finally sent the third solid shot flying after us she had to maneuver in order to get a proper range. “This showed to us conclusively the attitude of this man-of-war, and when she trained her guns upon us the Spaniard meant business. “It was only because of bad marksmanship and an inability to keep up with our clean pair of heels that saved us from the round shot that were sent after us. “They struck the water on a line directly astern of us, at a distance, I should judge, of from one-eighth to one-quarter of a mile. “The Allianca at that time was fully six miles out to sea and, strictly speaking, was on the high seas. “Capt. Crossman did not believe that he was called upon to further recognize the Spaniard after he had answered her salute with our colors. Capt. Crossman Has Seen Service. Capt. James A. Crossman, the commander of the Allianca, came into public notice in the Fall of 1893, when he was put in command of the cruiser America, formerly the Britannia, which had been purchased by Flint & Co. and fitted out as a war vessel for the Brazilian government during the late troubles there. The crew for the vessel was recruited here and all enlisted for service in the Brazilian cause. On the voyage lo Brazil the America met with an accident to her machinery, which delayed her, and later Capt. J Crossman slipped and fell down the steps from the bridge, breaking one of his legs and incapacitating him for further service. He left the America and returned to his home in Jersey City. Capt. Crossman was born in Hudson, N. Y., fifty-two years ago. He has been a seamen thirty-five years. He served in the United States Navy during the civil war. The Allianca is a screw steamship of 2,205 tons. She is halt brig rigged and was built at Chester, Pa., in 1886, by the Pennsylvania B and E Works. She is 303 feet long, 42 feet beam, 23.9 depth of hold and has three decks. Spain’s Consul-General Had Not Heard of It. Arturo Baldasano, Consul-General of Spain, whose office is at 2 Stone street, said this afternoon he had not heard of the firing upon the Allianca by a Spanish gunboat, so he was not in a position to make a statement. He supposed, however, that the Allianca, sailing in Cuban waters, refused to obey the commands of the gunboat, and was fired upon in consequence. The Star-Spangled Banner Commemorative Silver Dollar Coin shows with artist’s images of Capt. Crossman and the Allianca steamship, circa 1895.